PETER ECKLUND plays and composes in a unique style that mixes swinging jazz of 20s through the 40s with other traditional American music. Hes a founding member of the Orphan Newsboys, a swing quartet fronted by guitarist Marty Grosz. He has appeared with Woody Allens band at Michaels Pub in New York City. Ecklund is a regular at jazz parties and jazz festivals in the US and Canada. His own quartet (or quintet) has performed at many events and at festivals including the last two summers at the Great Connecticut Traditional Jazz Festival in Moodus, CT. This group also plays as a dance band, most recently for the swing dance societies of Albany and Poughkeepsie, NY and at the Falcon Ridge Folk Festival in Hillsdale, NY. He plays with two other swing dance bands at many important dance events around the country, Peter Daviss Lindy Hop Heaven and Jay Ungar and Molly Masons Swingology. Ecklunds cornet (and trumpet) can be heard in the films King of the Gypsies, Eight Men Out, Fried Green Tomatoes, and in many radio and television commercials including those for the Showboat Casino in Atlantic City, NJ. He has appeared often on Garrison Keillors Prairie Home Companion, and he is cornet soloist in the Ken Burns films The Civil War, Baseball and The American West. Ecklund has recorded with David Bromberg, Bonnie Raitt, Maria Muldaur, Gregg Allman, Leon Redbone, Jay Ungar, Molly Mason, Livingston Taylor, Loudon Wainwright, Hungry Chuck and many others. He has made albums of old-style jazz for the Stomp Off and Jazzology labels and a solo album featuring many of his own compositions for Arbors Jazz. He is now working on a second solo album for Arbors. There are about 30 jazz albums now available in which he appears as a sideman, including an album for Stomp Off by the French jazz group Paris Washboard and a total of five albums by two Boston bands, the New Jazz Wizards and the Back Bay Ramblers. 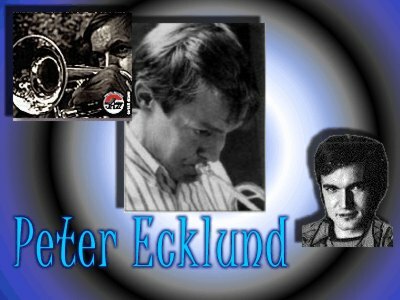 Ecklund has toured Japan with Marty Grosz and Ralph Sutton, and Germany with Grosz and pianist Keith Ingham, and Italy with Terry Waldo. He has performed frequently in France leading Trumpet Spectacular. This 7-piece band features Ecklund and three French trumpet players, Alain Bouchet, Boss Queraud and Irakli de Davrichewey, with a rhythm section led by pianist Pierre Calligaris. In late 1997, Ecklund toured the US and Canada with the Billie Holiday-style singer Madeleine Peyroux, opening shows for the pop singer Sarah McLachlan. Ecklund is the subject of a chapter in Traditionalists and Revivalists in Jazz, a book by the writer and jazz critic Chip Deffaa. He is the author of Louis Armstrong: Great Trumpet Solos, a book of transcriptions of Louiss most celebrated recorded solos published by Charles Colin, and Bix Beiderbecke: Great Cornet Solos for the same publisher. Other recordings inlude a collaboration with guitarist/singer Scott Foster titled The Potted Palm Orchestra in 2005.